♫♫ Special design for chatting on MSN,Skype & Hangouts,Gaming on Discord ,Streaming on Twitch, it's also perfect for voice recording; recording interview,presentation narration, video conference,online meetings for work; YouTubers who need to make video, vlogging,record podcast, add voice over, video commentary; and Singing on the internet. ♫♫ Plug and play,no extra gear needed. It is compatible with computers,PC,Just plug The 3.5mm stereo cord to the MIC port in your PC and it is ready to work. 100% brand new. High quality. Noisy cancellation. 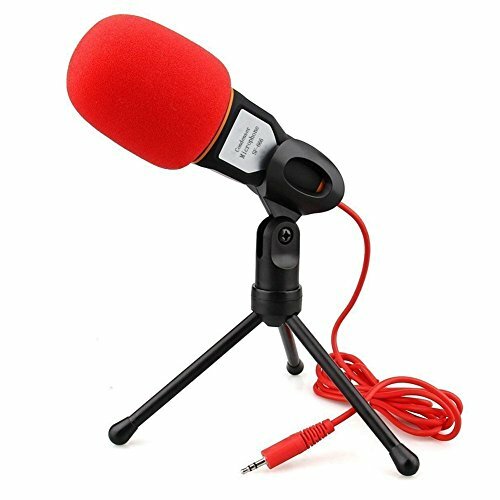 condenser microphone makes your voice sound clear and crisp.With a frequency resolution of 50Hz -16KHz, it offers a smooth audio without distortion. Conveniently stand with the help of the mini desktop tripod (Included). The tripod allows for 180-degree rotation,which enables you to get better sound quality by adjusting the right angle of Mic to the direction of sound source.